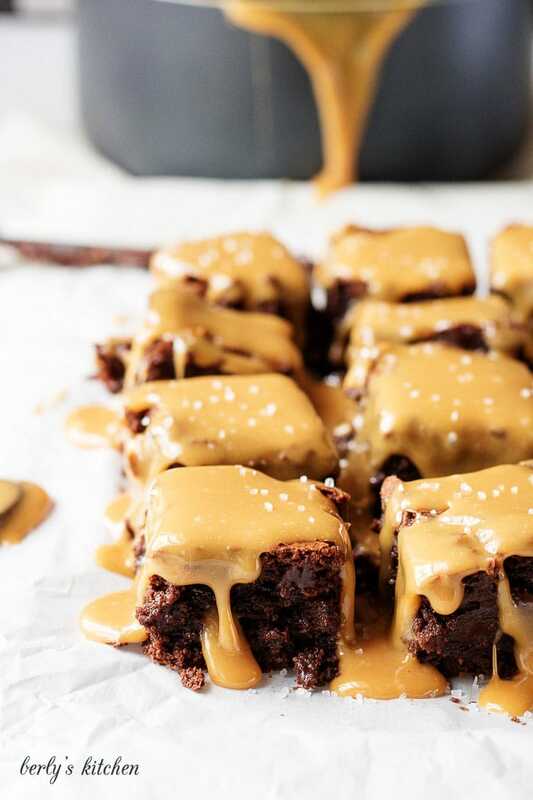 Stove top brownies with salted caramel sauce are thick fudgy brownies topped with a buttery, rich caramel sauce. Sweet and salty makes the perfect pair. Back some time ago, I started making brownies from scratch. They were actually one of the very first baking recipes I made on a consistent basis. As time went on, I decided to add a little bit extra to the brownies. This is where the salted caramel sauce comes in. If you read one of the more recent posts, you’ve seen my recipe for homemade caramel sauce. However, sometimes I prefer to use a simple jarred sauce or a quick and easy recipe. Most types of caramel topping would work well as long as they don’t harden when they cool. 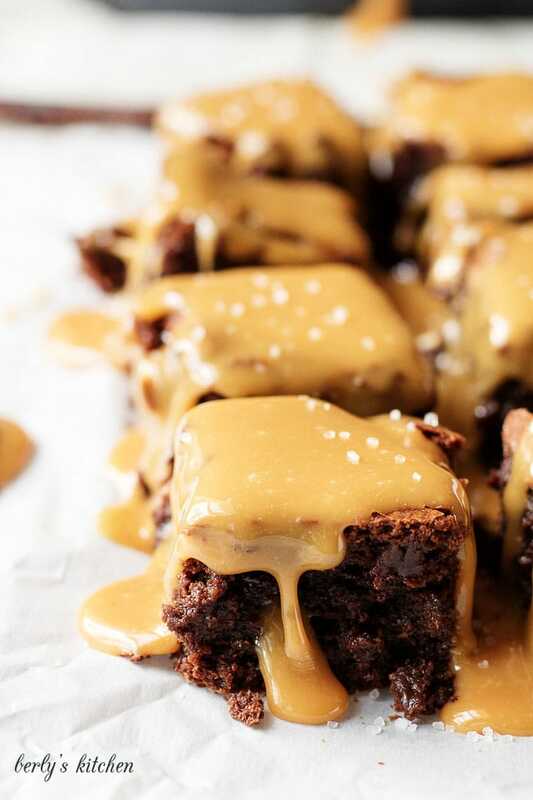 Brownies with salted caramel sauce are a sweet, indulgent treat that are so good, you can’t eat just one. 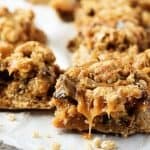 That aren’t difficult to prepare, but it’s easy to fool guests into thinking you spent hours in the kitchen working on these gems. Now, back to the brownies. It may sound a little strange to call them stove top brownies, but that’s how the batter is made. All the ingredients get mixed together in a large pan on the stove and then transferred to a dish for baking. The additional of baking chocolate makes these brownies super moist and fudgy. 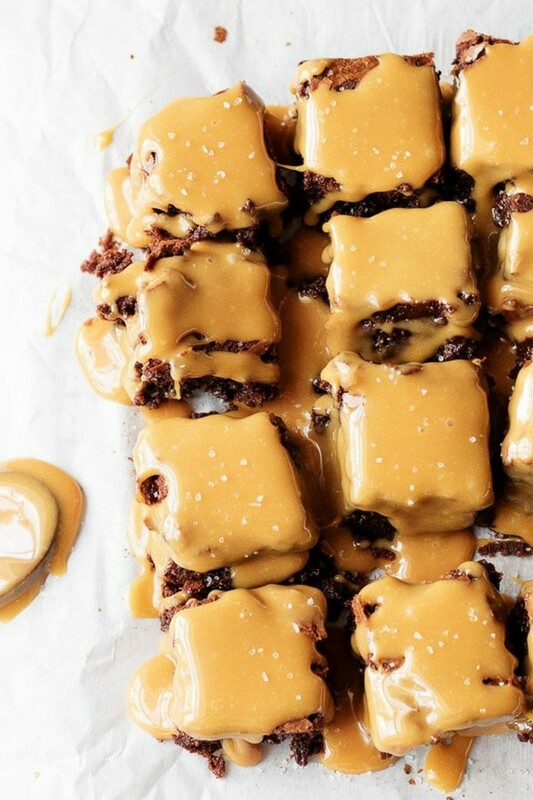 The fudginess pairs well with the gooey caramel. Just a word of caution about the baking chocolate. There was one occasion when I was right in the middle of making the batter and realized that I was out of chocolate squares. No big deal, right? There were semi-sweet chocolate chips in the cabinet, so I used equal amounts of those. Well, it was a very big deal. The brownies didn’t bake up at all. It was so disappointing, and they looked kind of gross. 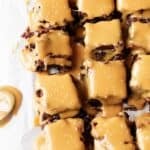 Maybe there is someone out there who can pull this recipe off using chocolate chips in place of the baking chocolate. However, that person is not me. 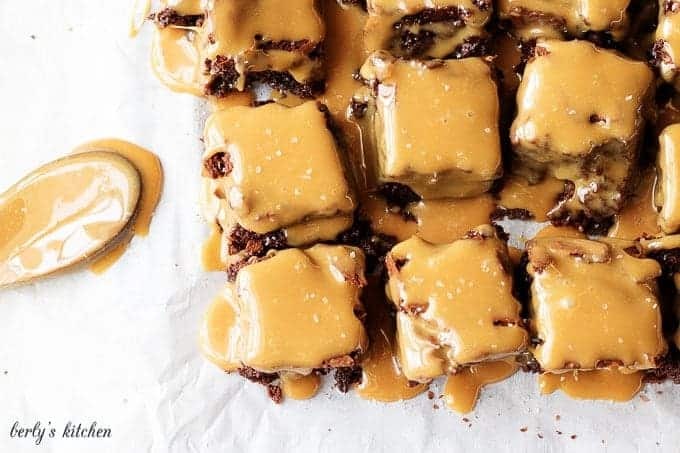 I’ve decided to stick with what works, which is my family’s favorite stove top brownies recipe (using the baker’s chocolate) topped with plenty of salted caramel sauce. Maybe one day we’ll get around to adding a scoop or two of ice cream to the party! 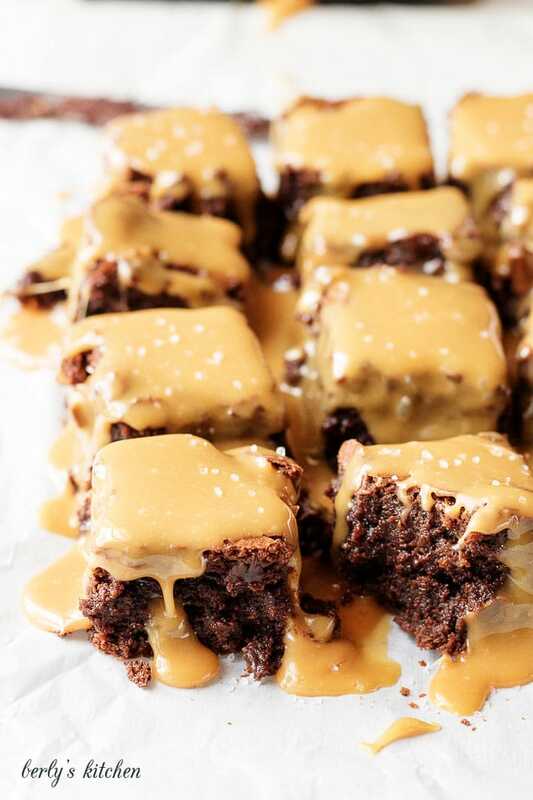 Stove Top Brownies with Salted Caramel Sauce are inspired by a basic brownie I located on Food Network’s site. I had hoped to share the link with you. However, I was unable to locate the recipe. Based on my printed copy, it was printed almost 10 years ago, so it may not even be on the site any longer. 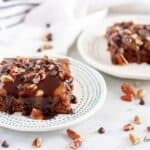 If you like this brownies recipe, please leave us a comment and rate the recipe card. You can also find us on Facebook, Pinterest, Twitter and Instagram searching for Berly’s Kitchen! Your favorite caramel sauce recipe or jarred sauce. Line a 9 x 9-inch baking dish with parchment paper. In a large pan, heat butter over low-medium heat. Melt butter and add sugar. Stir to combine. In a medium bowl, sift together flour, cocoa powder, and salt. Carefully pour the dry ingredients into the wet ingredients. Stir to combine, but don't over mix. Add the baking chocolate and stir until all the pieces are melted and mixed into the batter. Pour the batter into the baking dish and bake for 30-40 minutes. A toothpick inserted in the center will still be a slight bit sticky when removed. 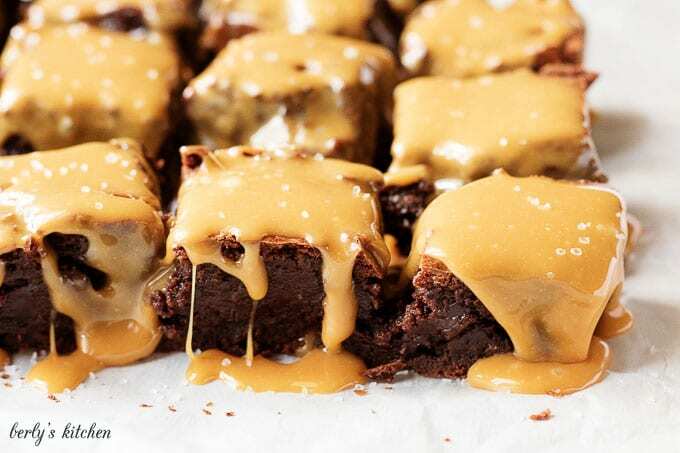 Remove the brownies from the oven and allow to cool completely before topping with caramel sauce. Heat the caramel sauce until it is easy to stir and pour. Add 1/4 teaspoon of salt and stir until combined. 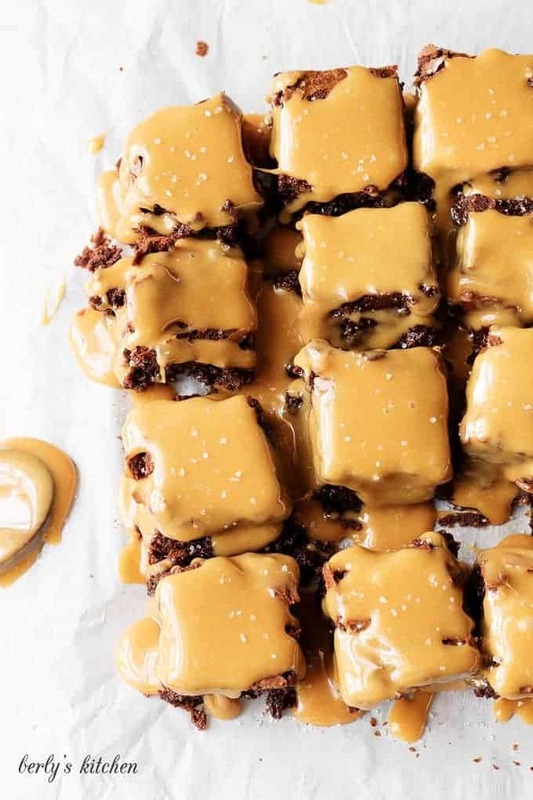 Pour the caramel over the cooled brownies, and sprinkle with sea salt. Serve immediately. Store in an air tight container at room temperature for 3-4 days. Yum! Those brownies look great. I’ll have to put this on to be baked list. I usually have baking chocolate in the cupboard, but just recently used them up. And forgot to put them on the shopping list. Nice photos.